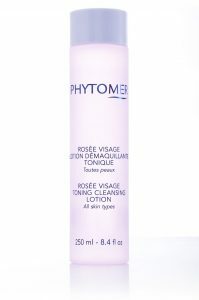 Rosée Visage is our best selling toner. And the bonus? It is also a make-up remover! Effective for all skin types, it has a barely-there hint of rose. Alcohol-free and infinitely gentle, Rosée removes make-up and tones without leaving an oily film. Skin is left velvety clean. Why use a toner? Toning is a skin care step that is often skipped, but it’s a crucial step to more youthful, radiant skin. Why? Toner removes even more make-up and residue than cleansing alone. It also removes minerals and deposits left behind by rinse water, such as salt and chlorine, that can have a drying effect on skin. Finally, toner prepares the skin, much better than water alone, to more effectively absorb the serums and moisturizers that are applied afterward. Look at a 40-year-old who tones and one who doesn’t and you’ll add this quick step to your own routine!